Robert Kraft issued his first statement on Saturday since being charged with soliciting prostitution last month, and Pats fans are not holding this one against him. The New England Patriots owner says he's been wanting to get this off his chest for the past month, and he finally got to do so in a statement released Saturday. Meanwhile, fans are sticking by him. "The fact that he apologized shows he's truly sorry and he's owning up to his mistakes," one fan said. 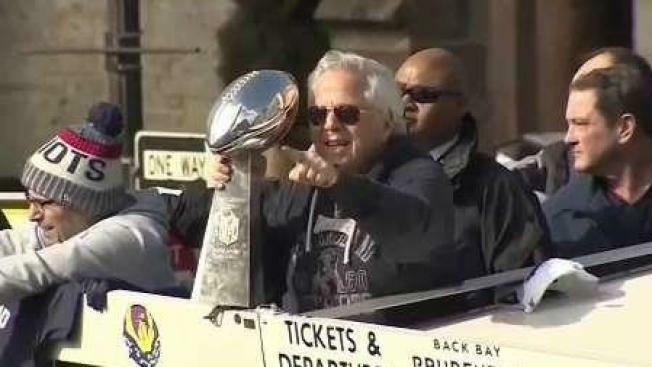 Longtime Pats fan Harry Binzan believes Kraft is a good person. "I think, personally, that prostitution should be legal," Binzan said. He hopes this will shine a light on the larger issue. "I'm hoping that would help young ladies and even men who are involved in that, who are the victims, get help," Binzan said. Niman Kankre says Kraft's status is what shines a light on this case. "When you're a person that's in the public eye like this, that's responsible for such a huge entity like the Patriots, I think that there's some responsibility that comes with that. And what makes his missteps kind of worse," Kankre said. "He needs to take responsibility." NBC10 Boston legal analyst Michael Coyen says Kraft's statement could be the first step in Kraft taking a plea deal. The deal would require him to enter a diversion program, but all charges would be dropped. "He would complete a short program of education, pay a fine and the charge ultimately will be expunged, as they would for most first-time offenders," Coyen said. So far, Kraft has pleaded not guilty to two counts of solicitation. "People in all walks of life have made major mistakes," Kankre said. "As long as he's sincere, let's move on from it," Binzan said. On Friday, an attorney for New England Patriots owner told ESPN a video of his client at a Florida spa, where he allegedly solicited prostitution, was obtained illegally. Adam Schefter of ESPN tweeted a statement from attorney William Burck Friday evening. "There was no human trafficking and law enforcement knows it. The video and the traffic stop were illegal and law enforcement just doesn't want to admit it," Burck said, according to Schefter. "The state attorney needs to step up and do the right thing and investigate how the evidence in this case was obtained." William Snyder, sheriff of Martin County, Florida, told CNBC Thursday that he expects the "explicit, sexual and graphic" content on the surveillance videos to be made public. "I watched and just left the room," Snyder said. "There is nothing to see. It's pretty ugly." The spotlight will be on Kraft Sunday as the NFL kicks off its annual league meeting in Phoenix, Arizona.